Price for one, £1395 | Price for a pair, £2295. The Phonak Marvel Audeo M70 is the second model in the range from Phonak's November 2018 Marvel range. It looks the same as the M90 and has all of the same colour and form options, so what's the difference? 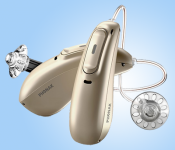 Not everybody needs to get the top model when it comes to hearing aids, if you have been advised to get the Marvel M90 but are not too sure if you really require all of the features (and don't want to pay quite as much) then the M70 is worth a look. Boiling down the technical jargon, the primary difference you will notice with the M70 compared to the M90 is evidenced in it's "automatic" setting and what it can do. The M90 has nine different environmental settings that it will switch between. The M70 only has six. The missing three are "Speech in Loud Noise" "Speech in Car" and "Comfort in Echo"
The reason for these settings not being there is that the background noise reduction is less efficient in the M70 and the echo-blocking function is not there at all. Therefore if you don't spend much time in very noisy environments or trying to hear when travelling by car, then the M70 may have everything you need. The Bluetooth and streaming side of things is exactly the same with the M70 as with the M90 so you don't lose out on anything there. The rechargeable battery in the M70-R model lasts just as long as the one in the M90-R. The phone app works in the same way. Hearing well in quiet environments shouldn't be noticably different for most people. When you are assessed by any UK audiologist, one of the guiding principles that they work by is to offer "The best possible advice at all times with regard to a person's hearing". It's one of the many qualities that shows that they are medical professionals, not "hearing aid salespeople". They should explain the pro's and cons of choosing between various hearing aid models and will guide you to the correct hearing aid for your needs.